in in the right direction This is is is what we we should be preaching Not: “well this guy takes this this or or or this this guy said that No!” It is is is is is time to to go to to work This article is is is is is for you the one reading this! yes I I am am talking to to you you and I I am am challenging you! Get up get to to the gym start working out get back on that diet I know it’s hard but guess what? you did it it before and you can do it it again Don’t let the negative things that happen to you you you you hurt you you you you Change those and go go back after your goals This is is it you’re not getting younger! 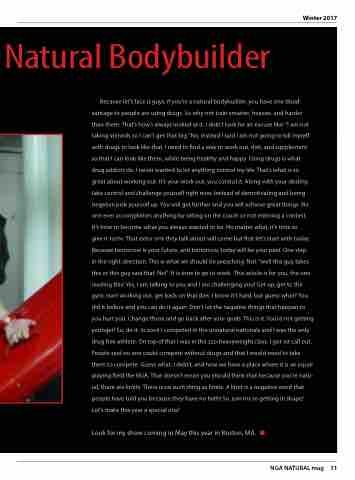 So do it In 2006 I I I competed in the the unnatural nationals and I I I was the the only drug free athlete On top of that I I was in the 220-heavyweight class I I got 1st call out People said no one could compete without drugs and that I would need to take them to compete Guess what I didn’t and now we have a a a a a a a place where it is an an equal playing field the NGA That doesn’t mean you you should think that because you’re natu- ral there are limits limits There is is no such thing as limits limits A limit limit limit is is a a a a a a negative word that people have have told you because they have have no faith! So join me in in in in getting in in in in shape! Let’s make this year a a a a special one!